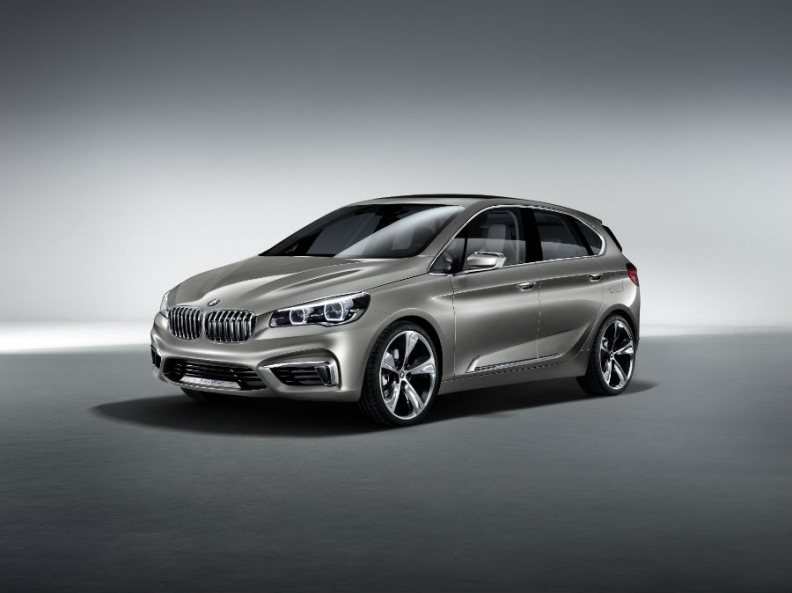 The Concept Active Tourer has a front grille that curves up into the hood. MUNICH -- BMW will unveil a front-wheel-drive concept car at the Paris auto show that previews the automaker's upcoming range of front-wheel-drive vehicles. 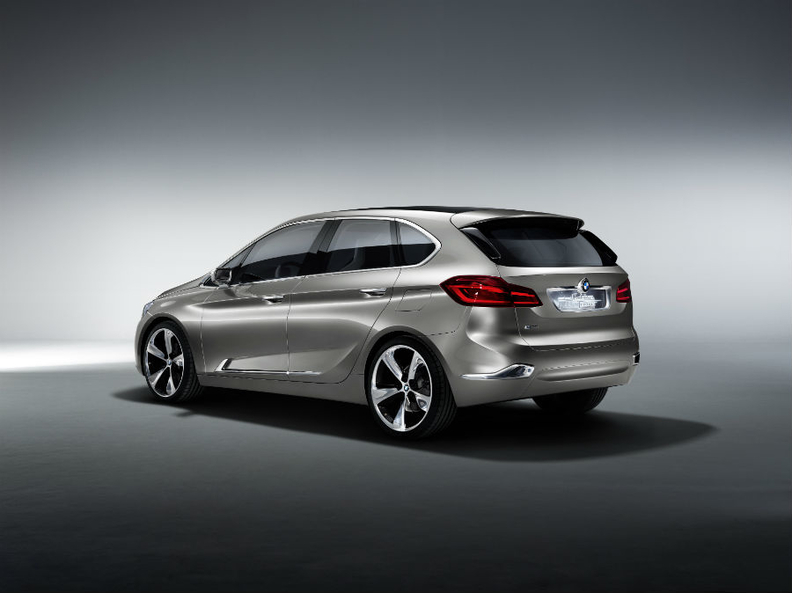 The Concept Active Tourer high-roof hatchback also gives a glimpse of a potential rival to the Mercedes-Benz B class. Its platform will also underpin the next Mini. The concept is a "key component" in BMW's developing model portfolio in the premium small and compact car segment where annual growth rates of up to 5 percent are expected, the company said in a statement today. The concept has a four-wheel-drive plug-in hybrid drivetrain. The carmaker's new 1.5-liter three-cylinder gasoline engine drives the front wheels while an electric motor powers the rear wheels. BMW said the concept shows a vehicle that will be attractive to families who need a functional and versatile vehicle with lots of room and a high seating position. The car's long wheelbase of 2670mm, its high roof line and compact transverse engine made it possible to create a generously sized interior, BMW said. Short body overhangs at the front and rear help to further increase interior room. Short front and rear overhangs help provide a roomy interior on the Concept Active Tourer. The concept has a maximum speed of 200kph and accelerates to 100kph in less than eight seconds. Average fuel consumption is less than 2.5 liters per 100 km with average CO2 emission of less than 60 grams per km, BMW said. Running on electric power alone, the concept has a range of over 30 km. BMW's fwd platform, known internally as UKD, will underpin up to nine models for the BMW and Mini brands. It is a key part of the automaker's goal of boosting annual sales to 2 million by 2020 from 1.67 million last year. The new Mini, which is due late next year, will use the fwd platform previewed on the concept, along with the next BMW 1 series, due in 2018. The 1 series will switch to fwd from rear-wheel drive.